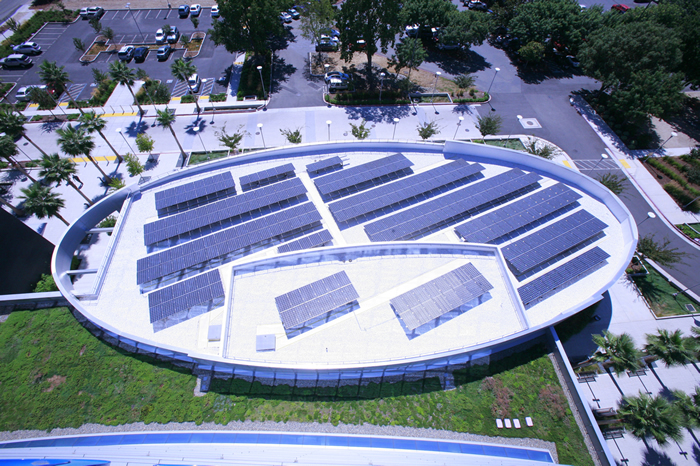 The Pavilion of CA Lottery Uses Ice Storage and Solar Panels to Achieve Net Zero. California Lottery, home to California’s POWERBALL, MEGA Millions, SuperLotto Plus and Fantasy 5, broke ground in February of 2010 on their new headquarters. By July of 2011, the new home for lottery operations was ready for occupancy. The headquarters consists of a 155,000 square-foot, 6-story main structure and a 400-seat net zero energy pavilion, which is used for staff meetings, training classes and lottery commission meetings. The $61 million facility incorporates multiple sustainable features, including ice-based thermal energy storage, green roofs, daylight harvesting, a photovoltaic system, window glazing and automated window coverings, all of which reduce operating costs, improve energy efficiency and reduce the structure’s carbon footprint. California Lottery was previously occupying a building that was inefficient and expensive to operate and sought to construct new headquarters that would be both functional and save on energy costs. A major feature of the new design included the construction of a net zero energy pavilion. For the pavilion to achieve net zero classification, it had to be designed to operate using no more energy than is provided by its own on-site generation. Of course, this would need to be accomplished without compromising occupant comfort. With project price being a top priority, it was important to integrate technologies that could provide a steady return on investment. Project leaders decided to use solar panels in the design of the pavilion and ice-based energy storage throughout the entire facility. These features would reduce operating costs once the project was complete and create a quicker payback period on the project. CALMAC’s IceBank® energy storage tanks were installed to provide the main structure as well as the pavilion, with nearly 2,000 tons-hours of cooling capacity. 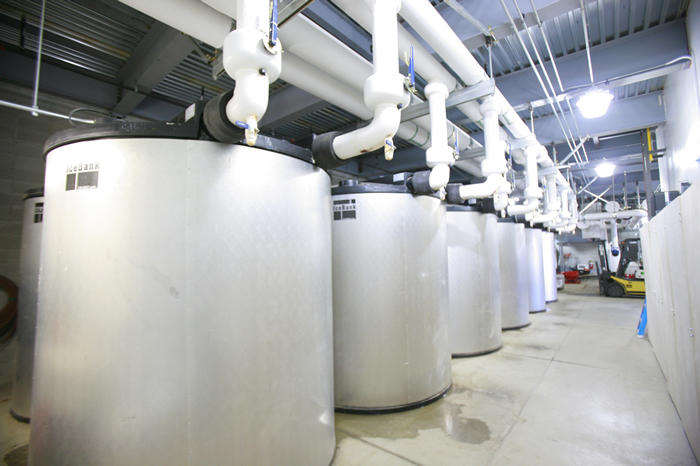 California Lottery’s two 200-ton chillers create and store ice at night, using energy from the utility, when demand is low and energy prices are discounted. The ice is then melted the next day to cool occupants during peak demand hours, when energy prices are significantly higher. The pavilion has two air handlers totaling 57.5 tons, as well as 100 kW PV solar panels. Any energy allocated to the chiller and energy storage tanks for the pavilion is offset by the renewable energy generated by the solar panels, thus the pavilion can be classified as net zero. When outside air temperature is less than 70 degrees, ice is burned from 6 a.m. to 10 p.m. When outside air temperature is between 70 and 80 degrees, ice is burned from 8 a.m. to 10 p.m. When outside air temperature is between 80 and 90 degrees, ice is burned from 12 p.m. to 10 p.m. When outside air temperature is between 90 and 100 degrees, ice is burned from 2 p.m. to 8 p.m. When outside air temperature is greater than 100 degrees, ice is burned from 2 p.m. to 6 p.m.
Any energy that is used to create ice in the pavilion is offset by solar panels. On an average sunny day, the PV system is even able to send 50kW back to the grid. The use of ice-based energy storage has allowed the entire facility to capitalize on the cheaper nighttime energy and avoid the tariffs placed on peak energy consumption by CA Lottery’s power supplier, Sacramento Municipal Utility District, during peak demand hours. For example, in 2012 CA Lottery was able to save 37 percent per kWh during summer super-peak hours, by using cooling that was created the night before. CA Lottery was also able to reduce cooling costs during on-peak hours by 21 percent during both the winter and summer. After completion the new California Lottery headquarters achieved LEED Gold certification by implementing technologies that drastically lowered energy consumption and operating costs. Through the use of building-side energy storage, California Lottery was able to implement a system that benefited both the facility and the utility company by shifting the building’s cooling load away from peak demand hours. Not only is the facility efficient, but California Lottery is even able to generate revenue by renting out the pavilion during the day, when it costs nothing to operate. When the pavilion is not in use, the energy generated from the solar panels is instead utilized to offset costs in the 6-story main structure. Overall, energy storage has helped to create a comfortable, economical and environmentally friendly environment for California Lottery staff and visitors.